The Chevron STEM Zone made their sixth appearance at the Bay Area Science Festival Discovery Day held at AT&T Park, and this year’s tent featured more exhibits than ever! This annual event offers hands-on experiments in Science, Technology, Engineering and Math like augmented reality stations, and wind energy engineering. Over 30,000 visitors were in attendance at this fabulous event, and JMP is proud to be a part of this educational community event. 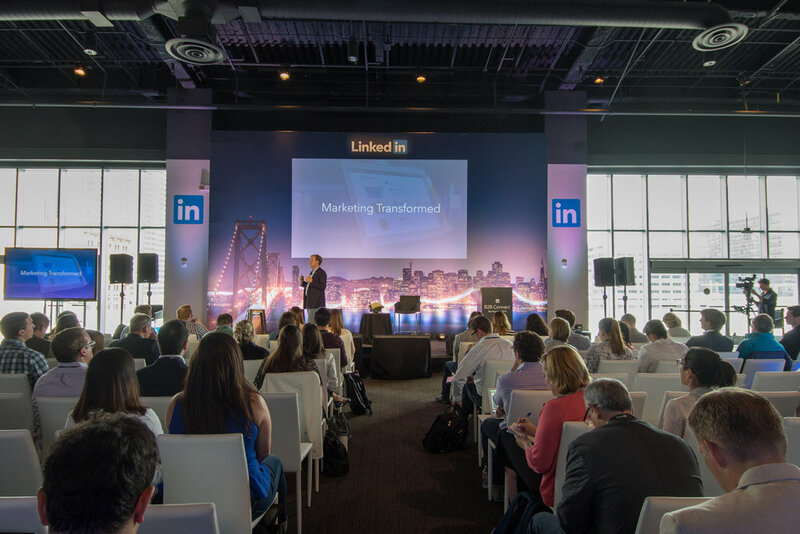 Skift held their recurring Tech Forum at the United Club at Levi's® Stadium in Santa Clara, and John Murray Productions was brought on board by the event production company Legend Productions Inc. to provide the scenic environment for Skift's popular event. Working from photographs of Skift Forums past, producer Tony Irik recreated the set for the more intimate space of the United Club, which required a shorter and narrower set that would provide the same impact as the original. The design elements included custom chevron sidewalls inspired by the shape found in the Skift logo and a faux concrete digital print backdrop with a 2" thick dimensional Skift letterset. The set was finished with a custom shaped stage deck that again incorporated the angle seen in the logo, and two large LED screens that flanked the stage. The challenge came in recreating a look from photographs in a tighter space than the original, but the thorough site inspection and quality build drawings ensured a seamless install. It was a pleasure working with Skift and Legend Productions Inc, and we look forward to working with them again in the future. When Mike Oku envisioned a giant 3D logo for his client AppDirect, he chose John Murray Productions to fabricate and install the multi layered centerpiece. This 40' x 16' stage set consisted of 5 layers all suspended by 1/16" wire rope on different vertical planes to give the set a floating appearance. Mike and his team of lighting designers subtly painted the set with light from below and video images were precisely pixel mapped to appear only on the logo, adding even more dimension to this stunning graphic. Thank you Mike for the great photos and the repeat business! In the world of corporate events, it's not every day you get asked to design a beach themed set. But not much surprises us anymore here at JMP, and when Atema Partners reached out to see if we could build such a set, we took on this playful project with gusto! The looked featured a 44' wide double screen hard surround set designed to look like the facade of a surf shop, complete with shop logo and windows full of surfboards. The beachy color palette of sea foam and beige was created using a multi colored wood trim for the stage fascia and footer on the paint finished screen surrounds. The challenge came in designing a high impact set for a small room with low ceilings. The result was playful yet polished, creating the ideal environment for a non-traditional corporate event. 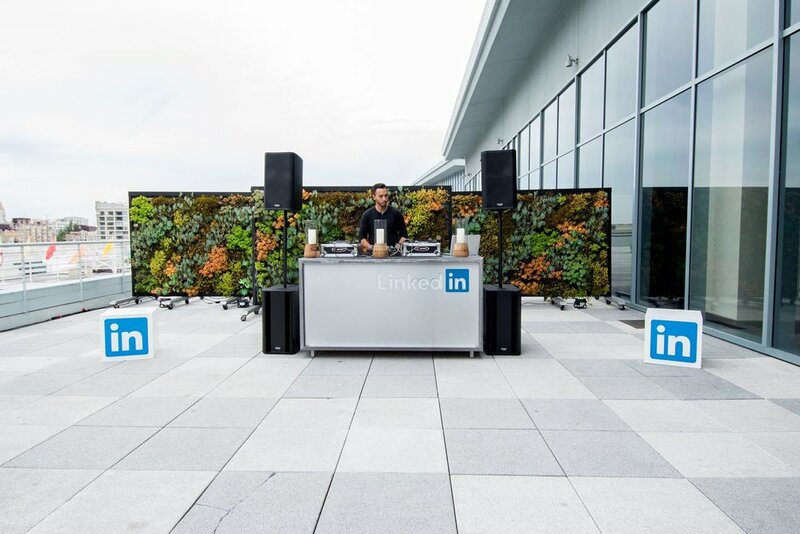 Professional networking giant LinkedIn held their B2B Connect 2015 conference at the Metreon in San Francisco, and John Murray Productions partnered with the designers at Invisible North to bring the event's environment to life. The event focused on the future of B2B marketing, and had a few interactive zones where our custom fabrication skills were called upon to create a user experience. The welcome treatment featured a custom built, aluminum finished archway with backlit logos. Continuing into the space, users were greeted by a double sided graphic wrapped wall that acted as a divider between the entry way and presentation space. 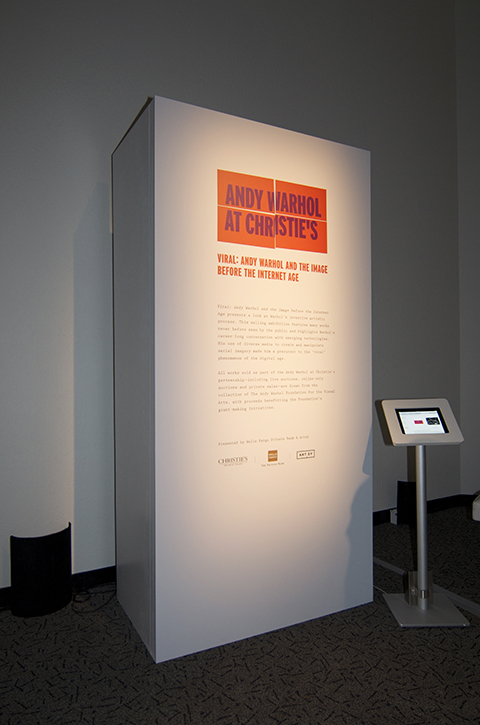 The front featured the event's branded imagery, while the backside acted as a screen surround for 2 monitors highlighting interactive features for the attendees. The presentation space consisted of a 26' wide x 16' flat wall nestled between the venues pillars, and wrapped in a fabric print which also acted as a screen for the presentation content. In addition,we branded our glo-bars on the cocktail reception deck with a backlit aluminum logo in a similar fashion to the entryway. The look was bright, vibrant and professional. Photos courtesy of the Invisible North & Jeremy Cortez Photography. Xactly hosted their annual CompCloud Conference at the Hyatt Embarcadero in San Francisco, and JMP worked with Seamless Show Productions to create the scenic environment for their fantastic event. 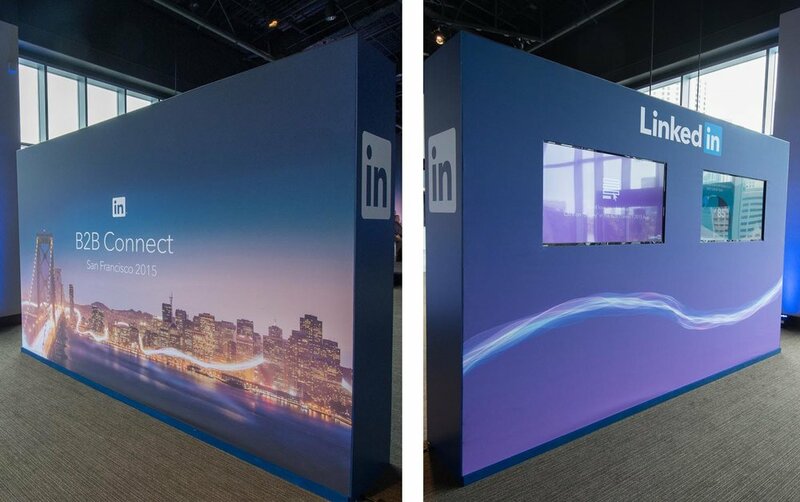 The grid-like set featured a 44' x 14' flat wall dispersed with 4'x4' glow boxes with backlit conference icons digitally printed and applied to the face. A dimensional 5' x 8' Xactly cloud logo acted as a focal point for the stage, while the upstage cyclorama allowed for dynamic light changes throughout the event. Click here to see more images from Xactly's event gallery. Oracle hosted their 2015 Cloud Conference at the San Jose Fairmont, and JMP worked with Invision Communications to bring the environment to life. The set featured a 16'h x 64' w seamless wrapped wall, with floating screen and dimensional logo. The ground row of lights were cleverly disguised with a dimensional San Francisco skyline which we created using our CNC router and large format printer. The look was clean and modern, creating the perfect environment for Oracle to present their cloud based software. Target partnered with John Murray productions for their official launch of Made To Matter: a collection of more than 120 store products from 16 brands recognized for their commitment to manufacturing their products responsibly. In efforts to achieve Target's mission for a zero-waste event, attendees explored the products among custom-built recyclable scenery which included wooden furniture and saw-horse tables, CNC routed tree displays, and a structural faux wall made from cardboard boxes. At the end of the event attendees packed up over 350 boxes full of products from the featured brands which were then donated to needy families throughout the San Francisco area via Glide, a local nonprofit organization dedicated to breaking the cycle of poverty. AXA is one of the world's leading insurance and asset management groups, and they held their 2014 Conference in San Francisco this May. JMP worked with Immersive Audio Visual to bring the event to life by transforming the gallery floor at the Terra Gallery into a 360 degree projection space created with muslin covered flat walls. We put our large format latex printer to work to create several printed fabric panels that accented the clean and polished look and complimented the dynamic motion graphics provided by the AV team. The challenge came in building over 100 linear feet of flat wall in the confined working space, within a limited time frame, but the result was modern and sophisticated, creating a brand centric environment ideal for conveying the company's message. The National Nurses United held their 2013 Staff Nurse Assembly at San Francisco's Marriott Marquis, and John Murray Productions, Inc. provided the scenic environment for their annual event. This was our 5th year collaborating with MetroMedia Productions on the Nurses Union's biggest event, and this year we wanted to design and produce a clean and modern look befitting of the Nurse's message and the recently updated hotel. Curvilinear lines and bright accents of nurses red and white were used to accent interconnected circular images of the nurses in action and create the look of the booths where attendees could learn more about helping the Union's cause. The hotel's largest ballroom was utilized for the event's general session and evening entertainment, and the simple and sophisticated set included brand elements such as the nurses logo which acted as a projection surface, and custom made curvilinear screen surrounds. We also transformed the hotel's Mission Tunnel into a gallery featuring black and white photographs of the nurses in action. Six 8' x 12' walls, highlighting six of the nurses' causes, flanked the hallway while an interactive chalk wall allowed an outlet for the attending nurses to comment on their importance in today's society. Overall, the event was a great success and we look forward to working with the Nurses on their next big event. Google held their 2013 Global Partner Summit at the Computer History Museum in Mountain View this Spring, and John Murray Productions, Inc. worked with MAS Events to design and fabricate the main stage set and 3 breakout rooms for the technology giant's annual event. The set for the general session included a seamless 70' wide flat wall and screen surround with custom light boxes and 3D logo as visual elements. The edge-lit boxes added dimension to the stage, with a modern look reminiscent of the De Stijl design movement. 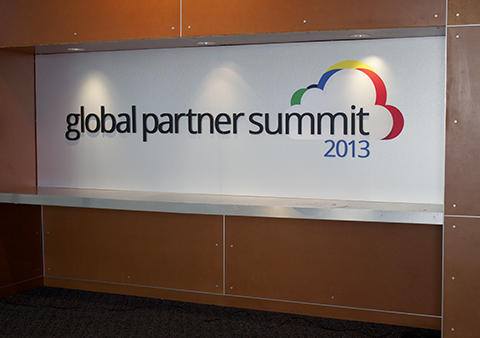 Three separate breakout rooms included flatwall screen surrounds branded with the partner summit logo, while custom fabricated directional sign posts and graphic walls tied in the look throughout the museum's second floor. The effect was contemporary, clean and modern, befitting of one of the world's most prestigious brands. 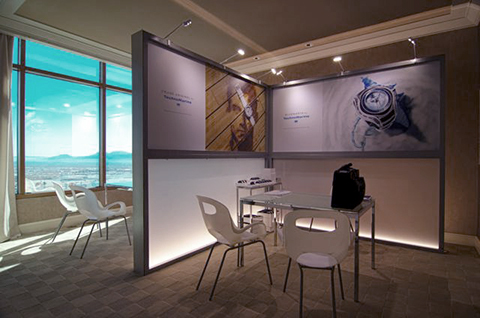 JCK Las Vegas was held at the Mandalay Bay Resort & Casino and for the third year running, John Murray Productions, Inc. designed and installed a custom environment for high end watch brand Technomarine in one of the resort's penthouse suites. The suite's transformation included 5 separate office spaces that were partitioned using our GLO wall panels. Creative from their latest ad campaign was framed and lit to create the walls, while window clings and watery floor graphics finished the look for the suite. Natural light from the highrise hotel windows added a bright, fresh element that complimented the ocean inspired look of the Technomarine brand identity. National Golf Day, an annual event designed to celebrate the economic, social, and charitable impact of the game of golf in the United States, was one of the stops on the Chevron STEM Zone tour. The event took place in Washington D.C. and part of the JMP STEM zone crew flew out to install a few of the STEM Zone exhibits, designed to highlight the science of golf. To learn more about the event click here. The annual JCK Watch and Jewelry show was held in Las Vegas this May and for the 4th annual year John Murray Productions, Inc. provided the scenic for Movado group's private viewing and office space in the Mandalay Bay Resort penthouse suite. 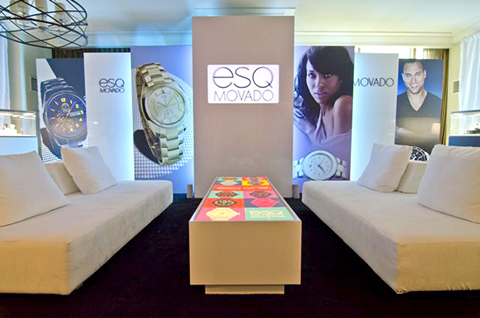 The Movado Group includes Movado, ESQ and Ebel, and each brand had their own space to showcase watches from their current line. The clean and modern look of the set utilized images from the brands' current campaigns to provide a sophisticated backdrop for which to highlight their products. With a seamless install and very pleased clients, this out of state event was a huge success. When Be. wines contacted PS Communications with needs for a last minute sponsorship opportunity at NYC Fashion week, we were enlisted to partner with the east coast's Legacy Scenic & Productions to design, fabricate and install a booth that would highlight their new wines. Designed to look like a young, fabulous New Yorker millennial's closet, the booth utilized the brand's bright color palette as the key element in the design. Large format graphics were used to create the illusion of a closet wall, while actual shelves were built out on the back wall to feature the wines alongside fashionable accessories. The brand's four wines, entitled Flirty, Fresh, Radiant and Bright were accented on the wall by their own colors, with the brand's logo featured in the upper left wall. A dazzling faux ceiling was created by draping chiffon above an elaborate crystal chandelier. The look was made complete with a perfect pink carpet. The challenge came in designing and building the booth within a very narrow time period, but in the end, the Be. brand was beautifully represented and the client extremely satisfied with the result. Restoration Hardware held their annual sales convention this summer, and John Murray Productions, Inc. was brought on for the second year in a row by production group Grass Shack Media to design and fabricate the set for the plenary session held at the Intercontinental Hotel in San Francisco. We used the Restoration Hardware gray as the color for the set, which allowed for various color changes throughout the event as well as consistent brand representation. The teamResto dimensional logo served as the focal point for the stage, and was painted in the same hue as the rest of the set creating the illusion of the letters emerging from the back wall.